A vital part of being a craftivist is the reflection and thinking that you can do while stitching, so it’s important to make time time to engage in craftivism on your own. 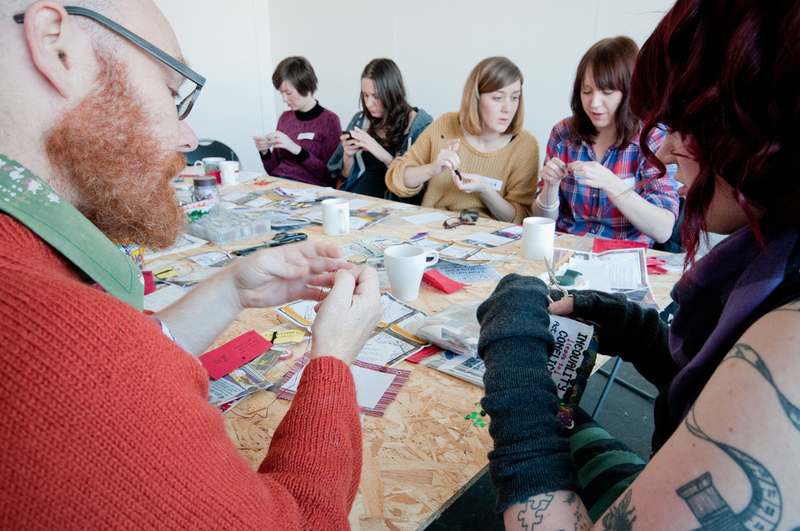 But there is a pleasure to crafting in groups too, which is why we love stitch-ins! Stitching with other people can create a safe space where crafters feel connected to one another in solidarity on an issue. You can help each other out with the craft and also with the complexities of the issue at hand, discussing it honestly and openly. And the great news is that organising a stitch-in doesn’t have to be difficult. You don’t have to coordinate an enormous city-wide event (although you could!) – it might just be as simple as inviting a few friends and neighbours round to your home or a local coffee shop to work on a craftivism project and discuss the issues over a cup of tea. Stitching in public is a great way to engage people in conversation in a natural, non-threatening way, so find a popular area to craft in. But be respectful of the venue though; if it feels like you’ve hijacked the space, you’ll put people off. Crafting in small groups of five or six people is ideal. People will be curious and not scared to ask what’s going on. Make sure the size of your group does not overpower, intimidate or get in the way of others. You want your group to be approachable so that people feel comfortable engaging with you. Try to use environmentally friendly materials and recycle existing resources for your craft. You can buy project kits from our shop, or you can use materials from your own collection. Why not ask people to bring along their scraps and spares, so that the group can pool resources? 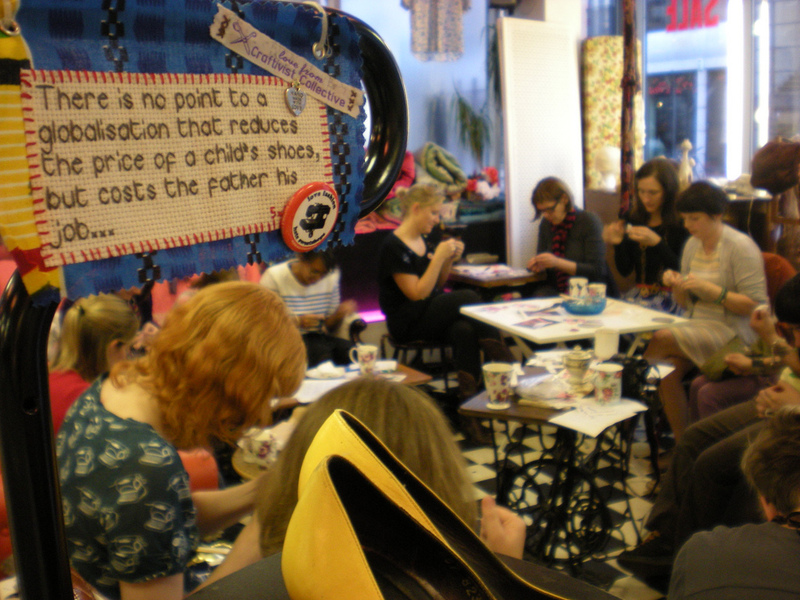 Be sure that there is information available for people who come along to your stitch-in, so that they can find out what craftivism is if they don’t know already, and so that they can learn about the project that you’re working on. As much as the craft is important, so is the chance to discuss and reflect on the issues you’re tackling. Look out for opportunities to work with an event that is already happening, or collaborate with a group, organisation or charity to maximise impact, holding workshops or devising a mutually engaging craftivist project. That way, you can really expand your reach. Finally, don’t rush: let the act of crafting relax you so you can think about why you’re doing it as well as what you’re doing, how and for whom. Remember, while stitch-ins are fantastic, it’s important to make time to craft alone, not always in a group. This gives you a chance to focus on the issue you’re crafting about without distraction! For details of stitch-ins going on in your area, visit our contact page.